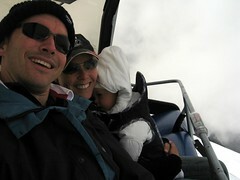 Sunday saw us heading to the 3000m mountain named Mt Titlis. 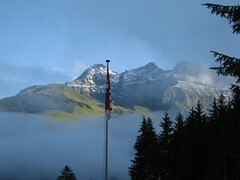 The area of Engelberg is surrounded by mountains with cable cars to get up them. There are several cable car stops and different routes you can take to explore them all. It would take a very long visit to get through them all so we decided to go for the biggest! 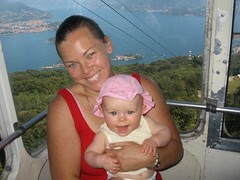 There is a small cable car that took us up the mountain for the first leg. They are very small ones and we just fitted in with Lottie in her buggy. 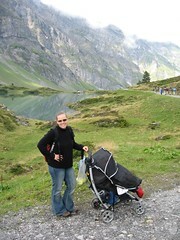 As the top of Titlis is 3000m above sea level, we had been advised to take Lottie up in stages so she ould not suffer any adverse effects at the top. So we stopped at Trubsee – 1800m above sea level. 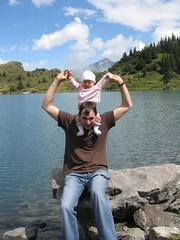 We had taken our usual picnic lunch and walked round the Lake Trubsee. It was very pretty here with little signs along the away in English to describe the many different plants and herbs that were growing in the area. There were also plenty of cows around to fertilise for the plants! 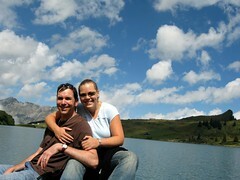 We sat for lunch on the edge of the lake and took some nice pics in the sun. There were little round stone barbecue pits complete with boxes of wood and paper for you to light a fire and cook your lunch. We saw a family using one with spare log seating around them, so we started chatting with them whilest our sandwiches were toasting! 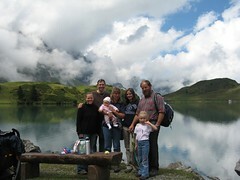 Swiss Family Mathis not Robinson! It was here we met the Mathis Family. 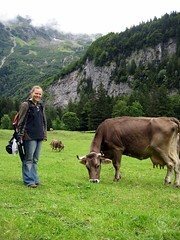 Denise and her hubby Hans are both Swiss farmers. They own milking cows and spent the summer on the Alps, following the cows to various levels up and down the Alp where they live in a hut- with their 7 children! They have huts on each level and they live, wherever the cows are living! In winter, they have a house in Engelberg. Denise also has bees and makes her own honey. We asked her where we could buy some of it and she invited us around to her home (the winter one!) that evening. We found the Mathis home and were overwhelmed by the beauty of it. A traditional Swiss Chalet perched on the side of a mountain, with stunning views. the Mathis Family built this house themselves – mostly Hans and his son, and they had help from a co-op style organisation. It took them 3 years! Plenty of wood, sloped roof, planter boxes with bright coloured flowers, spread over 3 floors – with 7 bedrooms and 2 kitchens it is an amazing home – you should be very proud. wWe were treated to a lovely supper. We sampled Denise’s honey with her homemade butter and cheese. We met some of the Mathis children – Antonia (who at the age of 5 and speaking no english, was fearless in her playing with Charlotte and took great delight in showing off her bunny rabbit and one of their 9 cats!) Vreni and Barbara – whose English was great and it was nice chatting to you both. Good Luck to Barbara who is off to the USA in a week or two – have fun and hope to hear from you soon Barbara! We had an unexpected meeting on a mountain over lunch, that led to us meeting a wonderful family. We wish you all the best with your farming and your family – and Thanks again for the lovely hospitality! 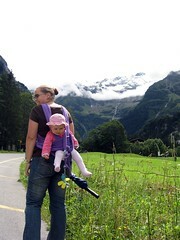 After our walk and lunch at Trubsee, we headed further up towards the top of Mt Titlis. You take a large cable car where you are all crammed in like sardines and standing until you reach Stand. 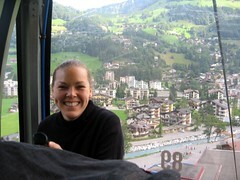 Here you change into another type of cable car where the centre rotates. It only taked 4 minutes in this car, but as you are rotating it seems longer! Charlotte drank milk during this time to make sure her ears did not suffer. She was fine. 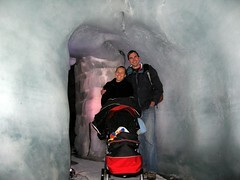 At the top of Mt Titlis there is an Ice Grotto. It is a cave in under the glacier that has been naturally formed. It is a fairly constant temperature of -1deg to 1 deg c and the ice temp sits around -1degc. We rugged up and went in for a look. It is free and pretty amazing in here! We decided to be brave (or stupid perhaps!) 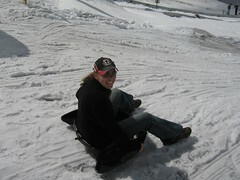 and take an open chair lift over the glacier itself. The visibility was pretty awful as we were surrounded by cloud. The sun glare off the white ice made it impossible to see without sunnies on and Charlotte was squinting badly for most of this time. 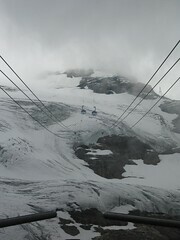 The chair lift was scarey but we survived and went down into the Glacier Funpark. They have free ‘toys’ for big and small kids to play with – so we took it in turns to nurse Charlotte in her sling and have a go! Dave tried SnowTubing – which involved sitting on a big rubber tyre and shooting around a curved track in the ice.Narelle tried her hand at a toboggan! We had a great time. When our wet undies got the better of us, we headed back to the top of Titlis for a hot chocolate and to begin our descent back down the mountain. 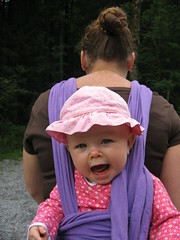 The weather on Friday (10th August) was lovely so we decided to putLottie in a sling a tackle some of the hiking trails around us. Narelletook her on they way there, and Dave on the way back! 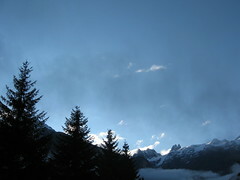 There is a area called Furenalps that we wlked to from the campsitethat took about 45 minutes. 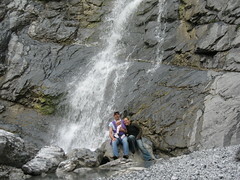 We passed sensational waterfalls and evenfound one on the way back – that was not signposted! After our picniclunch on the edge of a valley containing crystal clear blue rushingwater, we takcled the paths u p into the Furenalps. There were roaming cows – complete with their heavy cow bells andloads of people walking. We felt a bit out of place as we didn’t seemto have the right kit! You needed red jackets, walking poles, men -wear your knee high socks and your pants tucked into your hikingboots, khakki was the clour of the day! Anyhow – we walked for anotheror so then took a pretty path through the forest back to camp. We saw rock climbers, paragliders, walkers, mountain bikers – it was great to be out amongst it ourselves. And of course, the camera was busy. 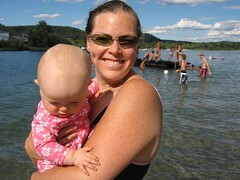 Enjoy the pics – it was a great day. Finally another update you say?! We have broken this one up into a few seperate posts to make for easier reading. 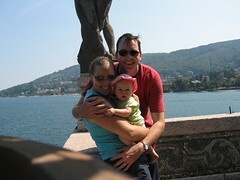 We left sunny hot Italy on the Wednesday before last to continue on our way to our next destination – Switzerland. 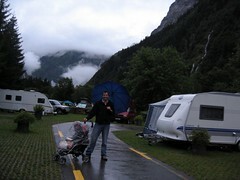 We had found a great looking campsite in our trusty Alan Rogers campsite Guidebook (which is now our bible!) 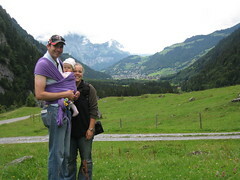 that started with the words ..”.This super site has facilities which must make it one of the best in Switzerland” So being Barkers who want nothing but the best – we arrived at Camping Eienwaldli, Engelberg around 530pm. It was pouring rain and grey and gloomy and a chilly 12 deg c outside. Leaving our screaming daughter int he car – we legged it and got the camper up in record time of 25 mintues. We went to sleep that night fully prepared to move into the onsite hotel if our camper leaked or began to float away – the rain didn’t let up. The next morning – the view took our breath away. We were overlooked by mountains – lush forest covered ones, grey rocky outcrop covered ones and even snow capped ones to the left of our awning. It was fantastic. Although the rain came and went for our stay here, it was just amazing. The campsite is DEFINATELY the best one we have been to this trip. There was hot water in the sinks that you actually needed to add cold to to get your hands in. They had a below ground bunker room that held the washing machines that were the cheapest on our trip so far – at only 2francs per wash. Also this room had a giant air blower in it that dried all your washing – or even just your teatowels in the evening if you wanted to – brilliant! The shop at this site is also the best stocked one at any campsite we have visited so far. The pastries are to die for! There is a tv room, soap and toilet paper in the loos (this is great because in Italy and France you take your own! ), good pressure in the showers (although they coast a franc it is worth it!) – it’s the little things in life eh?! The site also has an indoor pool complex. It has been done like caves or grottoes and has an adult pool and a childrens area with water slide! There are saunas, beauty treatments, spas and steam rooms! Posh camping this is! 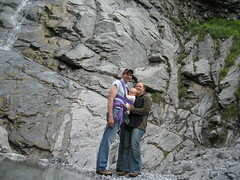 Although, it has also been on eof the cheapest campsites we have stayed at. So – we cannot recommend this place highly enough. The views were also absolutley stunning. We spent 7 nights here and fell in love with it. 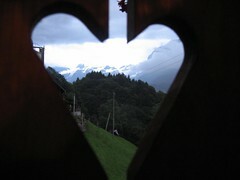 The town of Engelberg has so much to offer in both summer and in winter. 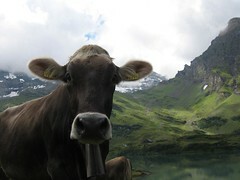 The sounds of clanging cow bells – (yes cows actually do wear them here!) the sounds of the rushing water – you are surrounded by it here as it comes down the mountains as the snow from the night before melts – MAGIC! Anyhow – enough bragging about where we stayed.. want to hear what we got up to during our visit? 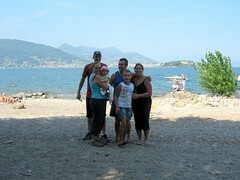 We arrived yesterday at this beautiful camp site Camping Italia Lido. 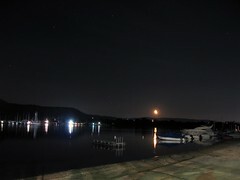 It is set on the southern tip of Lake Maggiore. 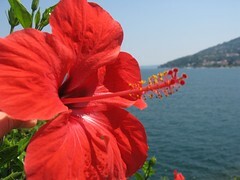 The facilities are basic but kept very clean; the main attraction is definately the lake. 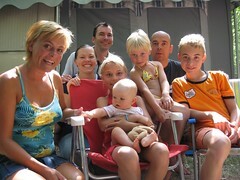 For the first time on this vacation we are surrounded by locals (Italians); so far we have always been in the pressence of mostly Dutch and Belgian campers. This makes a change as it is challenging our Italian speaking skills (well Narelles anyway). We had coffee last night with an Italian, Silvana, who Narelle got chatting with when doing the washing up. 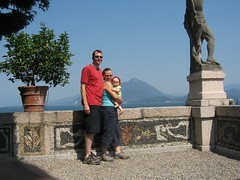 Silvana is on vacation with her son, Manuel and her husband who is coming on the weekend. After some broken conversation we have been invited for dinner on Saturday night; after Narelle had tried to invite them to dinner at the on site Restaurant; but it became confusing as we think Silvana thought we meant the restaurant outside of the camp site; and it ended up being easier for Silvana to invite us to dinner in her caravan. So we will keep you posted! 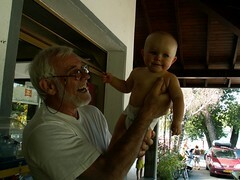 The Italians around us are very friendly and always want to say hello (ciao) to Charlotte; and we hand her over for cuddles with strangers in an effort to make sure that she does not get too clingy with us; this is especially important for the waiting grandparents back in Australia. 18th Sept – 10th Oct heading north through Holland, Denmark, Sweden and maybe Norway. So far the only real indefinite is after the 18th of September as we are not sure where we will be or how far north we will go, as it will all depend on weather, money and time. We will keep you posted.If you fancy a vacation somewhere in Europe – and you can see youreslves ‘popping across’ to join us somwhere – just drop us an email and let us know – the more the merrier! Make sure you check out the photos we have uploaded another 42 for your viewing pleasure. We didn’t do much here but relaxing, reading our books and having laughs with our new friends. 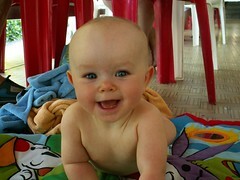 Charlotte spent many hours playing with her new friends from Holland – Mirthe and Linde. 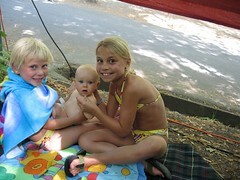 Only aged 10 and 5, the girls were great playmates – and seemed very confident in handling our girl! 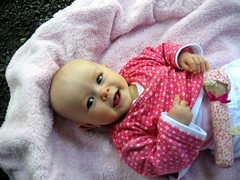 They helped entertain her, bath her and a big thanks for her new toy – her first ever beach ball – she loves it! Their brother Joris, a typical 12 year old boy and busy playing with his mates (and gameboy), also managed a hello and wave most days! He was a great help to Dave on our last morning when it came to packing up – so thanks for that Joris! He is also the pancake king of the Netherlands – so hopefully we’ll sample the delights when we next see you all. 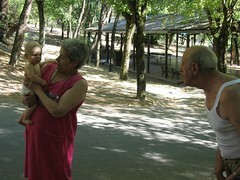 Another of Charlotte’s new friends was an older gentleman – Nonno (and his wife Nonna!) who took great delights in the giggles and smiles he always seemed to provoke out of Charlotte. Each day, on his way to/from his shower, he would dance, bang something, wiggle something and jiggle his false teeth towards her. We have never seen anyone get such a response so many times from the one person on different days – as Nonno did with Charlotte. It was hilarious and our cheeks her from laughing. Our new dutch friends were even laughing at this chaps antics! It was great. When Nonna had cuddles, she kept saying Mamma Mia, che bella! It was wonderful. 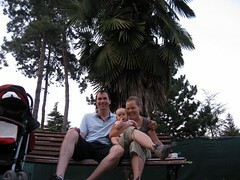 We went into Salsomaggiore for icecream one evening and Charlotte was happy grinning away at strangers from her buggy. She tends to pull herself forward in it now, gripping onto the front and eagerly looking out. It is very cute!